Research was conducted back in 2011 about the dangers that sitting can have on the human body, and the results are still true to this day. Dr. Levine at Mayo Clinic in Rochester found that male adults who sit for more than six hours a day have an overall death rate twenty percent than men who sit for three hours or less, and women have a forty percent higher rate. If sitting really takes this much of a toll on the human body, then isn't it time to do something about it? Spectrum believes so! In a recent post we shared some great tips on how to incorporate ergonomics into your workplace and even showed some of the ergonomic friendly products that Spectrum offers, one including the Evolution Stand-up Desk. This desk gives our customers the option to stand while they work helping to eliminate some of the reoccurring problems that sitting can cause on the body. Stand up desks have started to integrate more and more into the office and workplace settings. It is important to know not only the benefits of the stand up desks, but how to properly use them, so they don't do more harm then good. 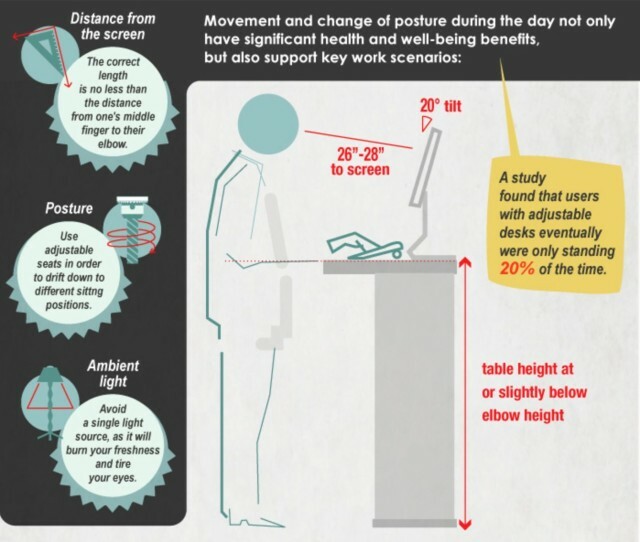 First let's look at some of the benefits that you can receive from using a stand-up desk. more energy throughout the day, even when they got home from work. This is because people who use stand up desks receive more oxygen, blood flow, and have an average increase in heart rate by eight beats per minute. Preventing Chronic Disease ran a seven week study to figure out some of the health benefits of standing desks. They found that the participants who were using stand up desks felt less fatigued, depressed, and tense. The participants actually felt more energized, focused, and happy. In the same study, the researchers also found that the participants started to experience less neck and upper back pain. This is because it's taking the strain off their neck and eyes when they are looking at their monitors. Sitting for long periods of time can slow down your metabolism and digestive track because you are keeping everything compressed. Once you stand, your internal organs are allowed to move, eliminating sitting cramps. As mentioned earlier, standing desks increase heart rate which plays a key role in metabolism. As you can see, one good thing leads to another. Studies have found that by sitting down your body automatically shuts off the circulation of lipase, a fat burning enzyme. When this is shut off your body doesn't process fat and cholesterol normally, leading to diseases such as heart disease, diabetes, and obesity. Now that we have talked about some of the key benefits of the standing desk, here are some tips to make sure you are using your stand-up desk properly. By using a gel mat, you get more support for your feet and pressure is taken off your joints. As a result you will feel better and be able to stand for longer periods of time. Another good item to use is a foot stool. They allow you to rest one foot at a time alleviating the pressure off some of the joints. Posture is everything. If you have bad posture, you increase the risk for injuries and your stand up desk doesn't serve it's purpose. 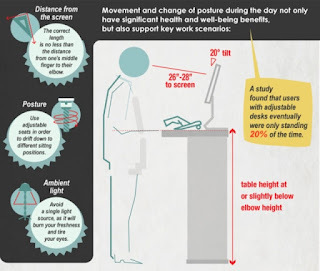 Here is an infographic to show the proper posture and techniques for a stand up desk. As simple as this may sound, it is crucial that you wear the appropriate shoes to be on your feet all day. If you find your feet are still hurting, it could be that you are using the wrong shoes for your feet type. If this is the case you can speak with a doctor to get a recommendation to figure out what kind of shoes work for you. It's important to not stay in the same position all day. Which is one of the main reasons to get a stand-up desk. Stretching throughout the day is important as your body needs that variation. It will help loosen your muscles and wake you up. You could even set a reminder on your calendar to stop and stretch. Or you could do it anytime you are feeling stiff. After going over the benefits of a stand-up desk and how to properly use them, it is evident why they are becoming more and more popular. 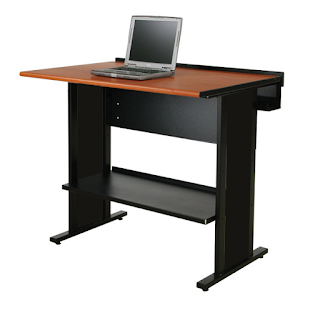 If you want to know more information about Spectrum's Evolution Stand-up Desk you can visit our website. Here you can go over more features and benefits and even configure the desk to make it more customizable.